Yesterday the Middle Stump had its 500,000th reader. From a small acorn formed over a pint, the oak tree is growing and along the way it has been a marvellous journey. Just over three years ago, I decided to write for a bit of fun. The odd anecdote had sprung to mind, and I wanted to get them all down on paper. To think that half a million people would read the rubbish that I write was beyond my wildest dreams and it has been a journey and a half. Over those three years, two books have been written along with an idea for a third that I am working on and interviews have been conducted with people who I never thought I would be talking to in a million years. From celebrities to musicians, to international captains, many professional cricketers and people involved in the game at all levels, the Stump aims to have a laugh and occasionally talk about serious cricketing matters. A third stage show of Pushing the Boundaries at Newport CC is about to be announced and many friendships along the way have been formed. The Middle Stump has raised not only awareness for Melanoma UK but hopefully we will help The Tom Maynard Trust too. I just want to say a big thank you to anyone who has retweeted, helped, given us a contract, bought a book, indulged in debate, been interviewed or even criticised. You have played your part. If any companies are interested in advertising to half a million cricket fans, then get in touch. 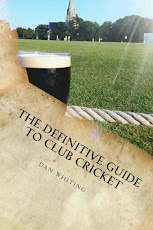 Trust me, it isn't expensive and an average of 12,000 cricket minded people a month read these pages. As one of our followers said the other day, "Cricket is not just a sport, it's a way of life". Long may that continue.